The itsy bitsy spider walked up the water spout… down fell the putts and knocked the wagers out. I like this Rossa Monza Itsy Bitsy Spider a whole lot more then its larger predecessor, the Rossa Monza Spider Putter. The smaller head is much easier to look at and control. The frame is 303 stainless steel, and the black piece in the center is made of a lightweight aluminum. Obviously, they used this to move the weight to the outside, giving the putter a high MOI. The coolest thing about this putter is it has adjustable weight ports in the rear wings, thus you can customize the total weight and let the toe hang how you prefer. I also like the alignment aid. I'm a big fan of straight lines on a putter, and this Itsy Bitsy combines straight lines with a half ball design for spot-on alignment. What's more is a couple of tour pros have used this putter in victories in 2009: LPGA Tour Pro Yani Tseng and Champions Tour Pro Michael Allen. Finally, this putter would seem to be a bit of a knock-off of Odyssey's Two Ball Putter line. You might want to check out a few of their putters before purchasing this one. 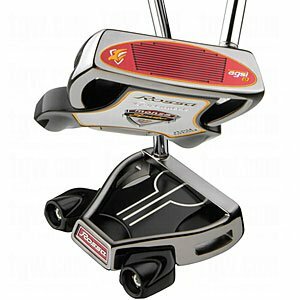 I would recommend the Odyssey White Hot XG 2-Ball SRT Lined Putter. This is a 2-Baller except Odyssey has added Saturn Ring Technology, two rings that run from the putter face back to the wing of the putter giving the putter an even higher MOI than the standard 2-Ball putter.